From the Department of Laboratory Medicine and Pathology (J.A.H., T.J.K., J.P.F., V.A.L., S.J.P., A.M.), the Department of Neurology (A.S.L.-C., V.A.L., S.J.P., A.M.), and the Department of Immunology (V.A.L. ), College of Medicine, Mayo Clinic, Rochester, MN; and Department of Neurology (M.D., A.F. ), University of Texas, Southwestern, Dallas. Objective To report a form of autoimmune cerebellar ataxia in which antibodies target septin-5, a guanosine triphosphate (GTP)-binding neural protein involved in neurotransmitter exocytosis. Methods Archived sera and CSF specimens with unclassified synaptic antibodies were re-evaluated by tissue-based indirect immunofluorescence assay. Autoantigens were identified by Western blot and mass spectrometry. Recombinant protein assays (Western blot, cell based, and protein screening array) confirmed antigen specificity. Results Serum and CSF from 6 patients produced identical synaptic immunoglobulin G (IgG) staining patterns of synaptic regions (neuropil) of the mouse cerebrum and cerebellum. The molecular layer of the cerebellum and the thalamus demonstrated stronger immunoreactivity than the midbrain, hippocampus, cortex, and basal ganglia. The antigen revealed by mass spectrometry analysis of immunoprecipitated cerebellar proteins and confirmed by recombinant protein assays was septin-5. All 4 patients with records available had subacute onset of cerebellar ataxia with prominent eye movement symptoms (oscillopsia or vertigo). None had cancer detected. Improvements occurred after immunotherapies (2) or spontaneously (1). One patient died. Conclusion Septin-5 IgG represents a biomarker for a potentially fatal but treatable autoimmune ataxia. Cerebellar degeneration leads to disability from loss of balance, incoordination, and speech impairment and can also affect cognitive function. Testing for an autoimmune cause is an important diagnostic endeavor in affected patients, particularly those with a subacute onset and rapidly progressive course.1 Affected patients may have an immunotherapy-responsive disease, occult cancer, or both. Herein, we describe 4 adults with a form of autoimmune ataxia unified by detection in serum and CSF of septin-5–specific immunoglobulin G (IgG). The Mayo Clinic Institutional Review Board (IRB) approved human specimen acquisition and retrospective review of patients' histories (IRB#, 16-009814). Indirect immunofluorescence assay (IFA), Western blotting, immunoprecipitation, mass spectrometry, protein microarray, and cell-based transfection assays were used to identify and confirm septin-5 as a target antigen (appendix e-1, links.lww.com/NXI/A55). Testing for previously characterized neural IgGs are also described (appendix e-1). Serum controls tested by IFA (470 total) were 317 healthy controls, 63 patients with cancer without neurologic disease, and 90 with other neurologic diseases (Creutzfeldt-Jakob disease , CNS systemic lupus erythematous , MS , and amyotrophic lateral sclerosis ). Sera tested by septin-5 IgG cell-based assay (CBA) were 30 healthy and 17 with ≥1 other paraneoplastic antibodies (anti-Hu, 13; collapsin response mediator protein [CRMP]-5-IgG, 7). All data pertaining to this article are contained within or published as online supplement. Indirect IFA of patients' sera and CSFs using cryosections of murine brain tissue demonstrated a novel identical staining pattern in 6 patients (figure 1, A–F). Specimens strongly stained synaptic regions (neuropil) of the mouse cerebrum and cerebellum. The molecular layer of the cerebellum and the thalamus demonstrated stronger immunoreactivity than the midbrain, hippocampus, cortex, and basal ganglia. The myenteric plexus of the gastric mucosa and the renal glomeruli were also reactive in all cases. The staining pattern superficially resembled that produced by gamma amino butyric acid B receptor antibody; all were negative by cell-based assay for that antibody. 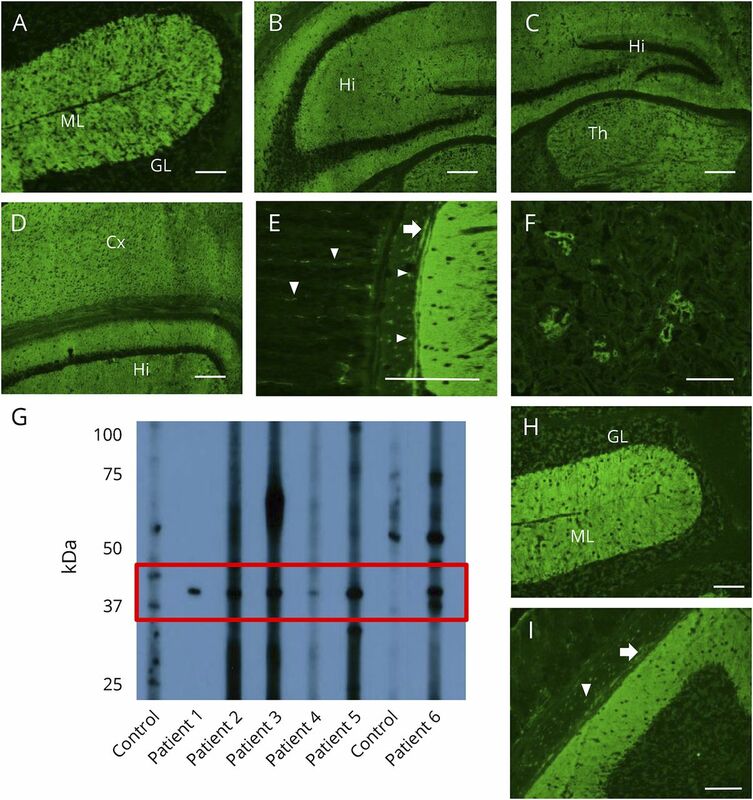 (A–F) Patient serum produces synaptic staining patterns of cerebellar ML more than GL (A); Hi (B, C, and D); Th (C); Cx (D); enteric ganglia (arrow) and nerves (arrow heads) (E); and renal glomeruli (F). (G) Mouse cerebrum proteins, reduced, denatured, and separated electrophoretically, produced a ∼45-kDa band when probed with patients' IgGs (patients 1–6) but not healthy controls' IgGs. (H and I) Application of IgG eluted from a nitrocellulose strip containing the ∼45-KDa band to mouse tissue reproduced the patient's IgG staining pattern (E). Scale bar = 5 mm. Cx = cerebral cortex; GL = granular layer; Hi = hippocampus; ML = molecular layer; Th = thalamus. Immunoblotting of mouse brain lysates with sera revealed a common immunoreactive band with approximate molecular weight of 45 kDa among patients only (figure 1G). A patient serum and purified IgG eluted from that patient's 45-kDa band demonstrated the same pattern of IgG staining by IFA (figure 1, H and I). To identify the target antigen, immunoprecipitation of the mouse cerebellar extract was performed using pooled IgGs from patients 2 and 6. Analysis by in-gel digestion and mass spectrometry of proteins captured by IgGs, immobilized by Affi-Gel, assigned the greater number of polypeptides to septin-5 (43 kDa). To confirm septin-5 as the antigen of interest, first, a recombinant form of septin-5 protein was used for Western blot analysis and probed with serum. Sera from patients 1 to 6, but not control sera, demonstrated strong immunoreactivity with septin-5 (figure 2A). Second, IFA demonstrated colocalization between commercial septin-5 IgG and patient IgG on mouse brain tissue (figure 2B). 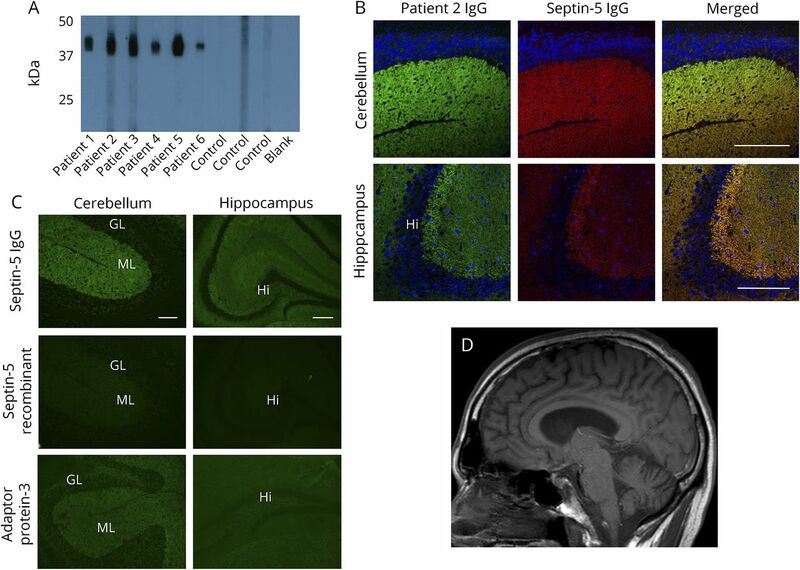 Third, mouse brain immunoreactivity of patients' IgGs was abrogated by the absorption of a patient's serum with septin-5 recombinant protein (figure 2C), but not with another synaptic protein, adaptor protein 3B2. Fourth, patients' sera and CSFs were tested by indirect IFA on septin-5–transfected HEK 293 cells (CBA, figure e-1, links.lww.com/NXI/A56). Sera and CSFs of all 6 patients were reactive with septin-5 (isoform 1 only). All controls tested by IFA and CBA were negative. Finally, the screening protein microarray was used in a blinded fashion to analyze the antibody profiles in sera available from 5 of the 6 patients (patients 1–5) and 5 controls (healthy and known to be neural antibody negative in our laboratory). Septin-5 was identified as the top candidate autoantigen among all patient sera and was not a candidate antigen among any of the controls. In each patient serum, septin-5 had the highest fold change in signal intensity relative to the controls and the lowest p value (table e-1, links.lww.com/NXI/A57). Because septin-4 and septin-7 were also identified as lower probability candidates, Western blots using recombinant forms of those proteins were undertaken using all 6 patient sera. Patient 3 had coexisting septin-4 IgG detected, and the remaining patients were septin-4 IgG and septin-7 IgG negative. Other coexisting neural IgGs included low positive values of IgGs reactive with N-type calcium channel or glutamic acid decarboxylase, 65-kDa isoform (2 each). (A) Western blot shows IgGs in all 6 patients' sera binding to septin-5 recombinant protein (lanes 1–6); IgGs in healthy controls' sera are nonreactive (lanes 7–9). (B) Confocal microscopy shows patient IgGs colocalizing with septin-5 immunoreactivity in the mouse cerebellum and hippocampus. (C) Immune absorption of patient IgGs. Septin-5-IgG is robustly absorbed by the septin-5 recombinant protein, but not by the same amount of another synaptic protein, adaptor protein 3. (D) T1 sagittal MRI of the head from patient 5 demonstrating cerebellar atrophy. GL = granular layer; Hi = hippocampus; IgG = immunoglobulun G; ML = molecular layer. Scale bar = 5 mm. Four of the 6 patients were women. The median age of symptom onset was 59 years (range, 47–62 years). The median septin-5 IgG antibody value in serum for the 6 patients was 1:15,360 (range, 1:7,680–1:15,360; normal value ≤ 120). Clinical information was available for 4 patients (2 men and 2 women; table 1), 1 seen at Mayo Clinic. The median follow-up duration was 35 months (range, 1–77). All 4 patients had a rapidly progressive cerebellar syndrome. One patient had severe vertigo, nausea, and vomiting at onset, before developing cerebellar ataxia. Two other patients had prominent oscillopsia at onset. Two patients had accompanying tremulousness. One patient became encephalopathic and obtunded in addition, later in the clinical course. The 1 patient with routine CSF parameters available had an increased IgG synthesis rate. Head MRI (available in 2 patients) demonstrated cerebellar atrophy in 1 early in the disease course (figure 2D) and was unremarkable in 1. None had cancer identified. One patient spontaneously recovered. Immunotherapies used in 2 other patients with treatment and outcome data available included corticosteroids (2), plasma exchange (1), and IV immune globulin (1). Improvements were robust and sustained in 1 patient and transient in another patient who died 6 months later. Septin-5 IgG is a biomarker of a rapidly progressive, but treatable, form of autoimmune cerebellar ataxia. To date, based on limited clinical experience, we have not encountered a paraneoplastic case, although septin-5 expression is known to occur in neuroendocrine pancreatic tumors.2 Our data support autoimmune septin-5 cerebellar ataxia being a severe neurologic disorder, treatable in some but potentially fatal. Septin-5-IgG was detectable in both serum and CSF, although we do not have data to indicate whether the immune response is generated intrathecally, systemically, or both. As well as being expressed in CNS presynaptic terminals, septin-5 colocalizes with septin-7 and septin-11 at the branch points of neuronal dendrites.9 There are 2 septin-5 isoforms that differ in amino acid sequences at their N-termini, variant (v)1, the full-length adult protein, with which our patient specimens alone were reactive, and v2, a truncated neonatal form.3 Septin-5 deficiency has been associated with a neurobehavioral phenotype in mice and humans.10 Septins in general are capable of both self-association and formation of diverse function-defining heteromeric complexes with other septins. Coexisting septin-4 antibody was confirmed in 1 of our patients. A polyclonal response against various septin proteins within a heteromeric complex could occur in these patients. At this early stage, proteomic arrays seem to be useful screening investigative tools for novel neural antibody discovery, and future iterations may have utility in clinical diagnostic laboratories. Currently, testing for autoimmune septin-5 cerebellar ataxia can be tested for with optimum specificity by incorporating into a standard laboratory algorithm, which uses a screening tissue-based assay, followed by a confirmatory molecular assay. J.A. Honorat and A.S. Lopez-Chiriboga: data collection; analysis and interpretation of data; and drafting of the manuscript. T.J. Kryzer and J.P. Fryer: data collection; analysis and interpretation of data; and critical revision of the manuscript. M. Devine, A. Flores, V.A. Lennon, and S.J. Pittock: data collection and analysis and critical revision of the manuscript. A. McKeon: study concept and design; data collection; analysis and interpretation of data; drafting and critical revision of the manuscript; and study supervision. This study was sponsored by the Center for Individualized Medicine, Mayo Clinic. J.A. Honorat has a patent pending for Septin-5-IgG as biomarker of autoimmune neurological disease. A.S. Lopez-Chiriboga reports no disclosures. T.J. Kryzer holds a patent for and receives royalties from Marker for Neuromyelitis Optica, which has been licensed to commercial entities. J.P. Fryer and M. Devine report no disclosures. A. Flores received travel funding and/or speaker honoraria form Biogen and Multiple Sclerosis Association of America and served on the speaker's bureau of Biogen. V.A. Lennon receives royalties from RSR/Kronus for sale of aquaporin-4 autoantibody testing kits and for commercial aquaporin-4 autoantibody testing performed outside Mayo Clinic and received research support from MN Partnership for Biotechnology and Medical Genomics. S.J. Pittock has a patent pending for Septin-5 and MAP1B autoantibodies as biomarkers of neurological autoimmunity; has consulted for Alexion Pharmaceuticals and MedImmune (with fees being paid to Mayo Clinic); and received research support from Grifos, MedImmune, Alexion, and NIH, S.J. Pittock and Mayo Clinic have a financial interest in patents (#12/678,350 filed 2010 and #12/573,942 filed 2008) that relate to functional AQP4/NMO-IgG assays and NMO-IgG as a cancer marker. A. McKeon has a patent pending for Septin 5 and MAP1B as markers of neurological autoimmunity and paraneoplastic disorders; has consulted for Grifos, MedImmune, and Euroimmun (no personal compensation); and received research support from MedImmune and Euroimmun. Full disclosure form informaton provided by the authors is available with the full text of this article at Neurology.org/NN. The authors thank the Mayo Center for Individualized Medicine for research funding and Vickie Mewhorter for excellent technical support.
. “Medusa-head ataxia”: the expanding spectrum of Purkinje cell antibodies in autoimmune cerebellar ataxia: part 1: anti-mGluR1, anti-Homer-3, anti-Sj/ITPR1 and anti-CARP VIII. J Neuroinflammation 2015;12:166.
. Peanut-like 1 (septin 5) gene expression in normal and neoplastic human endocrine pancreas. Neuroendocrinology 2005;81:311–321.
. Neuronal expression of two isoforms of mouse Septin 5. J Neurosci Res 2010;88:1309–1316.
. The Mammalian septin interactome. Front Cell Dev Biol 2017;5:3.
. Septin dynamics are essential for exocytosis. J Biol Chem 2015;290:5280–5297.
. Cyclin-dependent kinase 5 phosphorylation of human septin SEPT5 (hCDCrel-1) modulates exocytosis. J Neurosci 2008;28:3631–3643.
. Septins regulate developmental switching from microdomain to nanodomain coupling of Ca(2+) influx to neurotransmitter release at a central synapse. Neuron 2010;67:100–115.
. Stiff person syndrome-associated autoantibodies to amphiphysin mediate reduced GABAergic inhibition. Brain 2010;133:3166–3180.
. Functional redundancy of septin homologs in dendritic branching. Front Cell Dev Biol 2017;5:11.
. Deletion of human GP1BB and SEPT5 is associated with Bernard-Soulier syndrome, platelet secretion defect, polymicrogyria, and developmental delay. Thromb Haemost 2011;106:475–483.